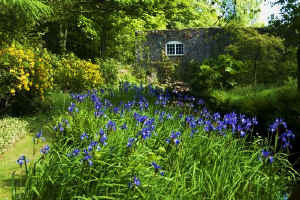 Geilston is a compelling and diverse 10-acre garden, enjoyed for its tranquillity but packed with horticultural delights. Enter the Walled Garden at Geilston and admire the 100 foot Wellingtonia. 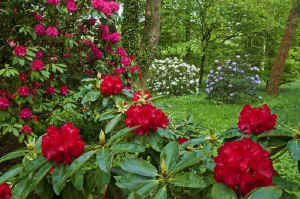 Spring brings brilliant displays of azaleas; in summer, the grand scale of the herbaceous border impresses. Explore the restored Victorian Mackenzie & Moncur glasshouse, and discover the 1797 potting shed with a secret window overlooking the Geilston Burn. Wander into the magical woodland garden with waterfall, bridges over the burn and mossy paths. In spring the woods are carpeted with bluebells and wood anemones. The new inspirational prairie border provides stunning summer colour. The large kitchen garden and apple orchard complete the tour. 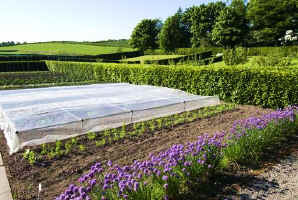 Fruit and vegetables, and herbaceous plants, are on sale in season. Geilston is intimate and tranquil, with the appeal of a private garden; unique surprises await around every corner. Geilston - a garden of genius! Geilston Garden (NTS) 2019 - Open daily from 1 April - see website for days and hours Hot drinks machine and biscuits available in reception. Disabled toilet: most of garden accessible with assistance (except woodland). No dogs allowed except assistance dogs. Train station in Cardross (1 mile); bus stop at garden gate. If you want to take a break near Geilston Garden, why not stay in one of our recommended hotels. Look now for Geilston Garden Hotels - click here.